Commissioned by the city, artists Jochen Gerz and Esther Shalev-Gerz described their design as a Gegen-Denkmal––a countermonument. 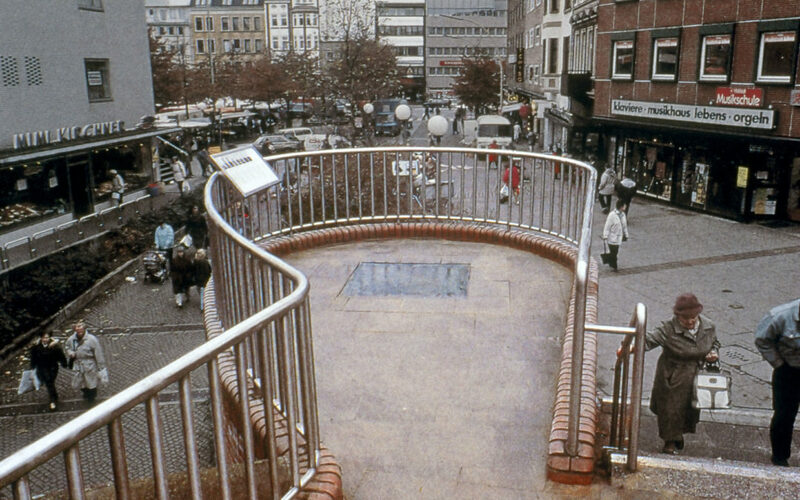 They rejected the city of Hamburg’s offer to place it in a park and instead constructed it in a pedestrian shopping mall in the working-class suburb of Harburg. It is a pillar, twelve meters high and one meter wide, made of hollow aluminum and plated with a layer of dark lead. An inscription near its base reads, in German, French, English, Russian, Hebrew, Arabic and Turkish, “We invite the citizens of Hamburg and visitors to the town, to add their names here to ours. In doing so, we commit ourselves to remain vigilant. As more and more names cover this 12 meter tall lead column, it will gradually be lowered into the ground. One day it will have disappeared completely, and the site of the Hamburg monument against fascism will be empty. In the end, it is only we ourselves who can rise up against injustice.” A steel stylus was attached at each corner by a cable so that people could sign their names onto the pillar. Every time one meter and a half of the pillar was covered with inscriptions, the monument was lowered. Unveiled in 1986, the memorial was lowered six times before sinking completely in 1993, with over 70,000 signatures inscribed onto its surface.